The Philadelphia Church of God is Bringing the Feast of Tabernacles to Tampa in 2012 - 2014! Well it is Linda Mummert again with more exciting convention news. Tampa Bay & Company is excited to announce that it will welcome the Philadelphia Church of God for its Feast of Tabernacles for three consecutive years beginning in 2012. Combined, the conventions will welcome 6,600 delegates to Tampa Bay, producing over 7,000 hotel room nights and creating $1.8 million in delegate spending. The Philadelphia Church of God is comprised of an eclectic group of people of every age, race, educational and economic background, from 67 nations around the world who are all dedicated to living by the truths of the Bible. The annual seven-day festival called the Feast of Tabernacles is held at locations all over the world, including Australia, India, Belgium, Peru and the Philippines. The event focuses on building Church unity and strong families through spiritual instruction and wholesome recreational activities. 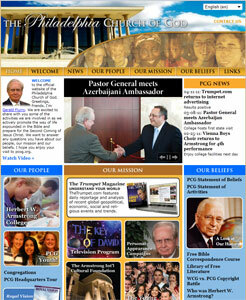 For more information, visit www.pcog.org. Stay tuned in for more updates on Tampa Bay meetings and conventions.